Discussion Point: Should START Researchers Embrace the Brain? Although neither of us are neuroscientists, we've been thinking a lot about brains lately. Both of us study different aspects of extremism and terrorism and are part of the National Consortium for the Studies of Terrorism and Responses to Terrorism (START). Gina is trained as an Industrial and Organizational Psychologist and I as a sociologically-oriented social psychologist, and we recently submitted a collaborative proposal to the Department of Defense's Minerva Solicitation to conduct a neuroimaging study of current and former extremists. The study we proposed relies on a match/mismatch paradigm by exposing study participants—who are current and former Neo-Nazis—to various types of ideologically congruent and incongruent propaganda stimuli in order to determine whether we can identify distinct neurocorrelates of ideological extremism as it relates to reactions to propaganda. Only one other published study, to our knowledge, relies on a sample of actual extremists to study the neurological characteristics of ideological extremism. Since 9/11, the field of terrorism studies has grown exponentially. Although much has been learned about the causes and consequences of terrorism, a number of questions remain unanswered. One question near the top of that list is whether exposure to extremism fundamentally alters our neurological makeup and generates distinct ways of processing information (i.e., terrorist mindset). Based on the General Aggression Model (GAM), it is likely that exposure to extremist movements might alter the pathways of how related information is processed. But where we think the rubber really hits the road in terms of this question is whether "former" extremists exhibit similar neurological characteristics as the "current" extremists. If we find this to be the case, implications for deradicalization and walking away from terrorism in general are many (Horgan, 2009). Our proposed plan of research will examine at a neurological level whether long term (and potentially permanent) neurological consequences of exposure to and participation in an extremist lifestyle exist by comparing physiological and psychological reactions to propaganda by current, former, and non-extremists. Based on our own ethnographic and archival research, we do not support this notion of permanent change in the extremist mindset. We rely on principles of neuroplasticity to suggest that as individuals begin changing aspects of their mental model by adopting different points of view, developing new social relationships and as more time lapses since extremist involvement, new neural pathways emerge and take shape that differ from earlier ones related to extremism. Whether you find merit in our proposal begs another more important question. Is there merit in social scientists exploring neurological dimensions of extremism and terrorism and human behavior more broadly? We want to take this opportunity to discuss what we see as some of the "pros" and "cons" of incorporating a neuroscience approach to the study of terrorism. The field of social neuroscience and neurosociology unequivocally answers this question. Studying behavior without the brain is like studying crop yield but ignoring the soil. Yet neurosociology has received little attention among sociologists while social neuroscience is beginning to gain traction in social psychology, anthropology, and political science. Overall, however, the neurological dimensions of human behavior are largely ignored by social scientists. Part of the neglect stems from adherence to rigid disciplinary boundaries ("let the neuroscientists study the brain; our focus is elsewhere"). Yet this thinking flies in the face of the very spirit of interdisciplinary studies. The mere consideration of neuro-related issues immediately encourages social scientists to adopt an interdisciplinary approach bringing together fields as diverse as neurology, sociology, psychology and many more. As members of the Center for Collaboration Science at the University of Nebraska at-Omaha, we are encouraged to examine our own research questions through the lens of an inter-disciplinary team. Part of the richness of this approach involves different methodological orientations and instruments that are used across fields. Gina and I are not planning to learn how to use an fMRI machine but are excited, nonetheless, about the prospect of collecting both spatial and temporal brain activation measures while asking individuals questions or presenting stimuli that we would normally ask or present. The value-added is clear in terms of triangulation. We collect external and internal data points simultaneously. The neuroimaging data is meant to complement not replace interview or survey data (Dimoka, 2012) by providing a different measure of certain processes and characteristics. Another interesting point to consider is the possibility that pioneers in the field of social psychology (e.g., William James and George Herbert Mead) would likely be inclined to incorporate neuroimaging as part of their respective research programs (Franks, 2010). Why? Because neuroimaging provides an opportunity to observe another dimension of how concepts such as the "looking glass self" (Cooley, 1902) operate. In recent years, some observers claim the discovery of "mirror neurons" (Rizzolatti & Sinigaglia, 2008) provides a neural dimension to Cooley's century old idea of the social nature of self-formation which fundamentally involves the process of "taking the role of others" (Mead, 1967). Neuro studies have also found that Solomon Asch's famous group conformity experiments involve a fundamental neurological dimension (Berns et al., 2005), which provides additional insight regarding the mechanisms and consequences of peer pressure. The idea that the human brain is fundamentally a social organ as opposed to an entirely physical one has been clearly documented (Wexler, 2006), yet some observers still remain leery about incorporating neurological aspects in social science research. As we see it, the most significant concerns are not so much with the incorporation of neuroscience but with the misuse of neuroscience. The concerns over misuse are serious and should not be minimized. As with any "new toy," neuroscience advocates, in some cases, tend toward reductionism. Neuroscience becomes a gimmick of sorts that can explain everything because human behavior is really nothing more than neurochemical processes that, once detected, provide us with all the answers. This kind of simplistic reasoning is harmful and completely at odds with a more sophisticated understanding of brain functioning and human behavior more broadly. Neuroscience lends itself to "gadget-like" thinking that, especially in the computer age, has become quite popular and pervasive. The danger is illustrated by a Nature article that boldly states, "Brain imaging ready to detect terrorists, say neuroscientists" (Giles, 2005: 457). Anyone who has spent even five minutes in an undergraduate terrorism course knows that we cannot even agree on a definition of terrorism let alone magically detect individual terrorists based on brain imaging. When we developed our proposal to identify an extremist or terrorist mindset we worried that at some point this might be confused with trying to identify markers of an extremist or terrorist brain. It is our strong belief, based on our academic training and a thorough review of the literature on neurocorrelates of aggression, political attitudes, and addiction that specific types of brains do not exist. Period. Instead, our goal is to triangulate known findings in our respective fields to examine the underlying neurocorrelates associated with attitudes, behavior, and emotional responses with a neuroscientific approach to data collection. In sum, the value-added of neuroscience seems to override concerns, especially since the most valid ones are not really about neuroscience per se but rather the misuse of neuroscience. But all methodologies are misused for nefarious purposes; certainly survey methods and ethnography have been used to harm subjects and to achieve untoward ends. 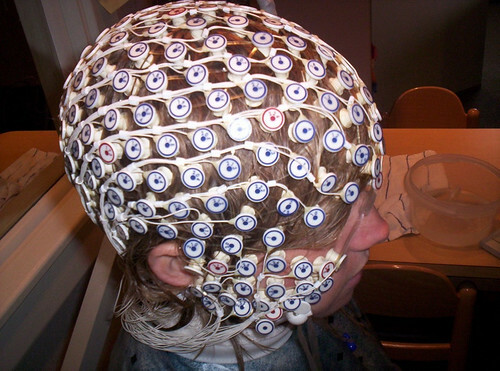 Thus, it seems that collaborating with neuroscientists to examine unique populations (e.g., extremists) that we as START researchers have access to is imperative to advance our understanding on how such phenomena such as deradicalization, propaganda, and social networks are associated with extremist behavior, attitudes, and physiology. Berns, G.S., J. Chappelow, C.F. Zink, G. Pagnoni, M.E. Martin-Skurski, & J. Richards. (2005). Neurobiological correlates of social conformity and independence during mental rotation. Biol Psychiatry 58,3, 245-53. Dimoka, A. (2011). Brain mapping of psychological processes with psychometric scales: An fMRI method for social neuroscience. NeuroImage, 54, 263-271. Franks, D. (2010). Neurosociology: The Nexus Between Neuroscience and Social Psychology. New York: Springer. Giles, J. (2005). Brain imaging ready to detect terrorists, say neuroscientists. Nature, 437, 457-8. Horgan, J. (2009). Walking away from terrorism. Routledge. Mead, G.H. (1967). Mind, Self, and Society: From the Standpoint of a Social Behaviorist. University of Chicago Press. National Institute of Health. (2012). Brain basics. Available for download at: http://www.ninds.nih.gov/disorders/brain_basics/know_your_brain.htm. Rizzolatti, G. & C. Sinigaglia (2008). Mirrors in the Brain: How Our Minds Shares Actions, Emotions, and Experiences. Oxford University Press. Wexler, B. (2006). Brain and Culture: Neurobiology, Ideology, and Social Change. Cambridge, MA: MIT Press.